Description: NS SD-40-2 leads NS 11A Westbound through the snow at Cassandra, PA. Description: Westbound on track two with two GE widecabs back to back. Title: NS Eastbound 20W @ 0958 hrs. 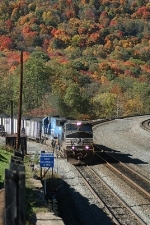 Description: An NS freight moves through downtown Dalton. Description: Approaches the signal at CP-Burn to head west. Description: Sorry for the grainy shot--taken during a hazy, humid day. 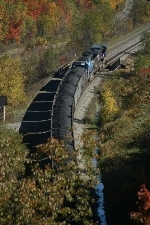 Description: A unit grain train is in dynamics as it begins to navigate the Curve. Description: Westbound 34A is passing CP Beaver at the east end of the Rutherford intermodal yard outside Harrisburg, Pennsylvania. Description: Westbound Mixed Freight,MP 116 Cove,PA. 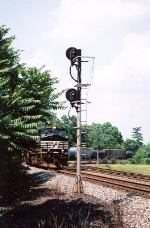 Description: This set of power wnet north of out Waycross early that morning and now is heading south.